Hello, I'm new to the forums and to the Linux world in general. 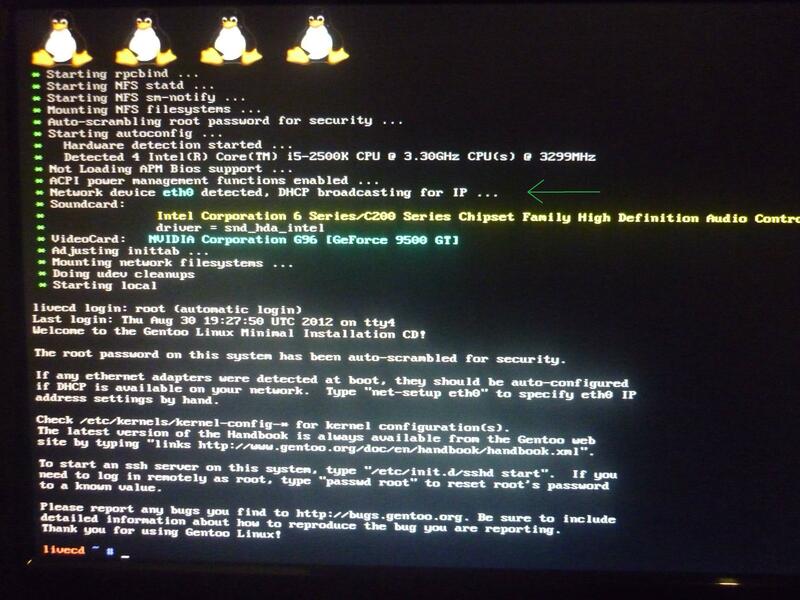 I've finally decided to give Linux a try, so I downloaded the AMD64 Gentoo Minimal Install CD and booted from it, but even though I've been following the handbook step by step it seems impossible to get my computer connected to Internet. As I stated before, I'm really new to Linux so please bare with my ignorance. Thank you. I hope we can make you linux experience informative, although I should warn you Gentoo is a rather advanced distro. But don't worry. We try to be as friendly and helpful as we can. first off, net.lo is a local thing that never goes to the net. So your device is eth0. 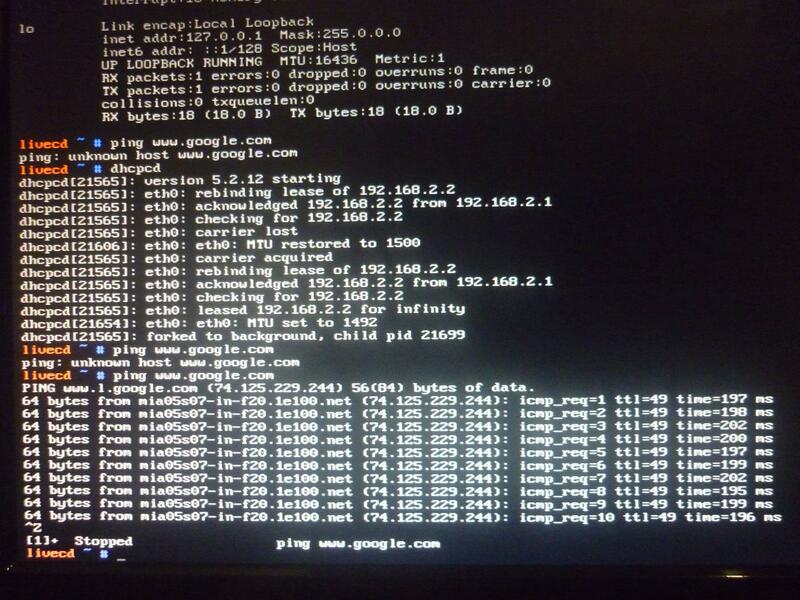 You should be able to just run netsetup on eth0 and then use ping -c 3 www.gentoo.org. If this does not work, you might want to use the system rescue cd to install. It will not change anything but it will give you a GUI network interface. I would guess that most of us use it. You do NOT need to mess around with pppoe. Your router does that for you. If that works but websites fail that it is just name resolution problems. You can fix those by using this: echo nameserver 8.8.4.4 >> /etc/resolv.conf.head This will tell the install environment to use the Google name server. After messing around with the net-setup and dhcpcd commands for a while, I got it working. After this huge success for me, I rebooted and tried to do that again. As I was expecting, I failed. I have absolutely no clue what could have happened so it started working, but I guess I'll have to keep trying until I get it right. Well, hopefully you can repeat your success. One thing to note is the command you want to use to kill something in your terminal is ctr+c. ctr+z keeps the process running and puts it in the background. For something like ping, you really don't want to leave it running as it will just drain your resources without providing any benefit. 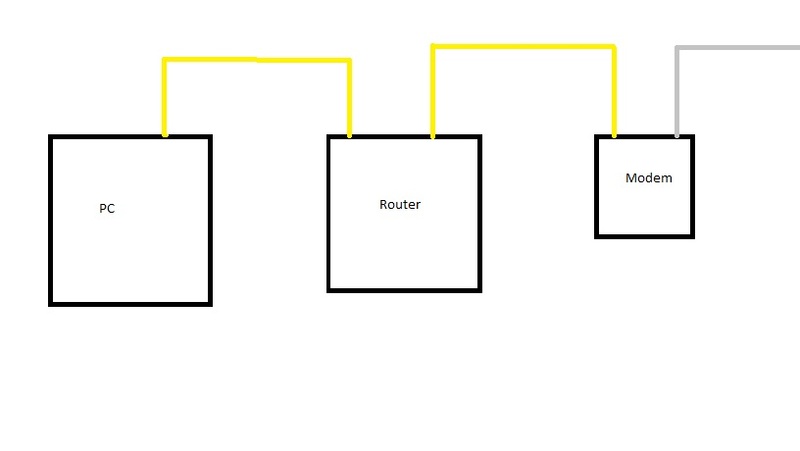 What is the inside ip address of the router? 192.168.2.1? to whatever it gets from the ISP for a default nameserver). Thanks, that helped me solve the problem. I wasn't setting up the gateway correctly (I was using the one that appeared on my router's config). config_eth0="192.168.1.3 netmask 255.255.255.0 broadcast 192.168.1.255"
192.168.1.1 is the lan-side ip address of the router.